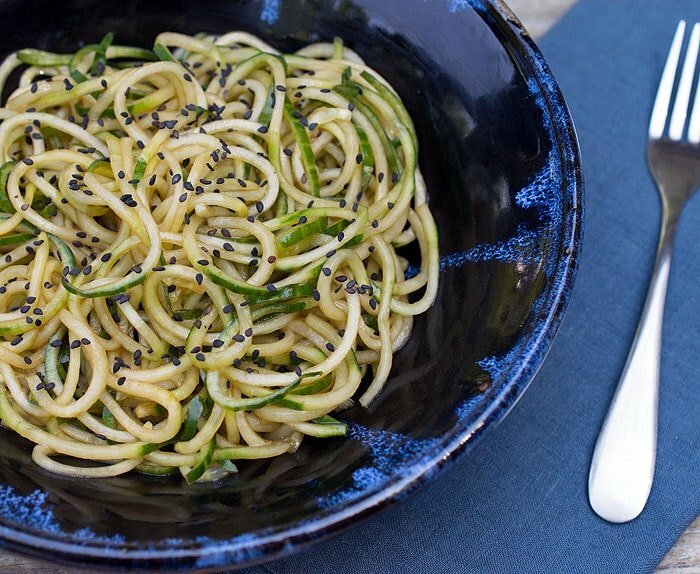 Today I’m sharing my latest favorite lunch – Super Easy Sesame Cucumber Noodles. It’s kind of a PF Chang’s Copycat only with spiralized cucumber instead of cut into chunks. To me, that makes it seem more like a real meal and more filling. 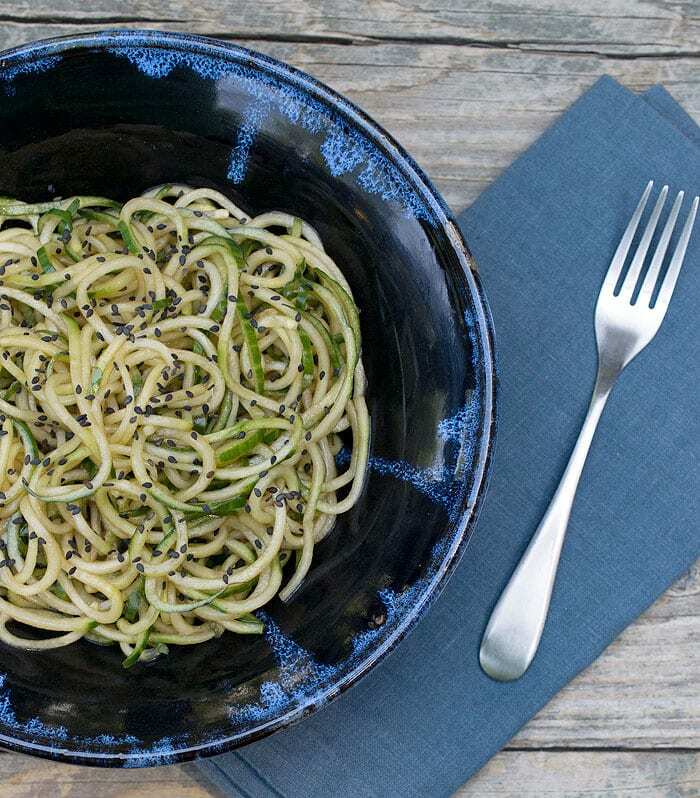 I would love to know what your go-to summer meal is and if you already have a spiralizer. Please let me know in the blog comments. Thank you! This recipe is so easy, I can hardly call it a recipe. With that said, I’ve been eating it every day for lunch the past 2 weeks just because of its ease. I really don’t like the heat of the summer. It makes me slow down and feel lazy. To solve that I often do any cooking or spiralizing in the morning or the night before when it’s cooler. Also, don’t forget that cooking in your slow cooker or Instant Pot will keep your kitchen cool all summer long. This is a great summer lunch or dinner. I've been eating it almost every day with some baked tofu straight from the fridge on the side. You can make this a day or two ahead of time to make the heat even a bit easier. Spiralize the cucumber. Break the noodles into soba-sized lengths. Mix the rest of the ingredients in a medium-sized mixing bowl. Toss the noodles in and mix. Plate up and sprinkle with sesame seeds. I am in love with my spiralizer and will be posting more summer recipes with it! This was delicious! I was looking for something quick & easy to add to our lunch of tofu, hummus, and bread – perfect! <3 - I miss you!! Yes, spiralizers are great. Any and all recipes appreciated!!! This one looks really tasty! Thank you, thank you, thank you. It has been hot and humid here in South Western Ontario. We don’t feel like moving let alone cooking and bonus, recipes that use up the abundance of cucumber we have growing in our garden. I don’t have a spiralizer but I do have a rotato that will make the “noodles”. I will be making this recipe for dinner tonight. I don’t see soba noodles as an ingredient, but mentioned in instructions. The word soba is used to give an idea of the length you want to cut your cucumber noodle to. Break the noodles into soba-sized lengths. Kathy, I have no idea how long that it is… can you help me out with further explanation? It’s a little shorter than spaghetti, but you can cut them to the length you like best. Thank you for this. I’ve been making cucumber slices with soy sauce and toasted sesame seeds for a snack. 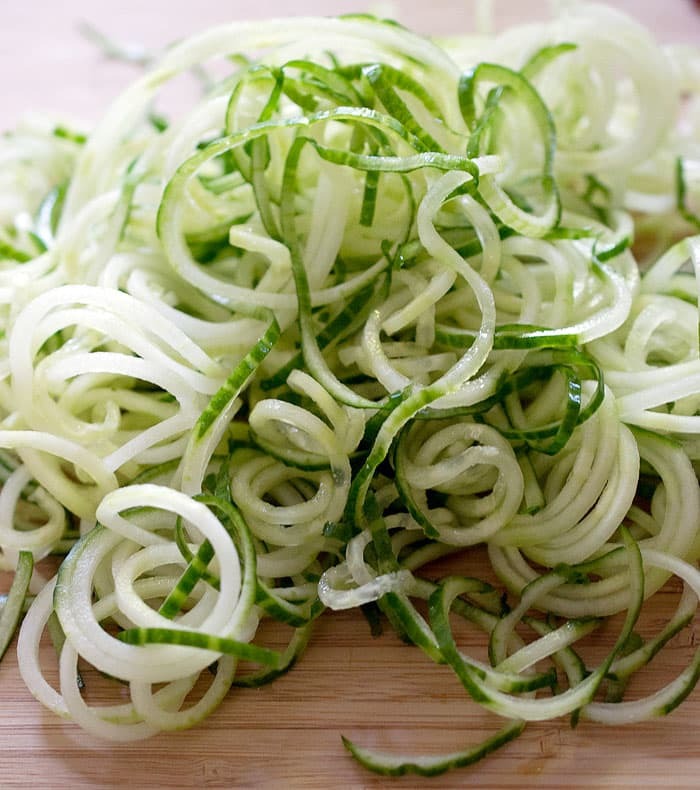 I never thought of spiralizing the cucumber or adding rice vinegar or sesame oil. I’m confused. Is this a salad or do you use a slow cooker. It is an uncooked main dish.